Motorcycle and moped drivers have the same rights and duties as drivers of motor vehicles. Learn more about motorcycle rules and responsibilities by downloading the Florida Motorcycle Handbook. Learn more about approved motorcycle safety courses, motorcycle endorsements or Motorcycle Only licenses, by visiting the Florida Rider Training Program. Under Florida law, motorcyclists must wear eye protection and U.S. Department of Transportation-compliant protective head gear or helmet. Motorcyclists over age 21 can only ride or operate a motorcycle without a helmet if they have proper insurance coverage. To obtain a motorcycle endorsement on their driver license or a Motorcycle Only license, motorcyclists must complete an approved motorcycle safety course. Motorcycles and mopeds may not be operated on bicycle paths or foot paths. Never attempt to share the lane with a motorcycle. The motorcyclist is entitled to the entire lane. Watch for motorcycles and look carefully before pulling into an intersection or changing lanes. It is difficult to gauge the speed of a motorcycle; they may appear to be much farther away than they really are. Do not follow too closely behind a motorcycle; motorcycles have the ability to stop more quickly than other vehicles. Motorcyclists often slow down by down-shifting or rolling off the throttle, thus not activating the brake light. Never pass a motorcyclist with only a few feet of space. The force of the wind gust can cause the rider to lose control. When being passed by a motorcycle, maintain your lane position and do not increase your speed. Maintain a four-second buffer zone between you and a motorcyclist, and increase space when encountering inclement weather, gusty winds, wet or icy roads, bad road conditions and railroad crossings. In Florida, the bicycle is legally defined as a vehicle and has all of the privileges, rights and responsibilities on public roads (except for expressways) that a motor vehicle operator does. Bicyclists may ride out of the bike lane in the travel lane for their own safety on narrow roads to avoid obstacles or pavement hazards, or to prepare for a left turn. A bicyclist may use the full lane even while traveling substantially below the speed of traffic if the lane is too narrow for both a car and bicycle to share. To learn more about laws and safety rules for bicyclists, see pages 40 and 41 in the Florida Driver License Handbook. Obey all traffic controls and signals. Do not ride a bicycle under the influence of alcohol or drugs. Stay alert – do not text while biking or wear headphones or ear buds so you can hear everything around you. You may use the full lane when making a left turn, passing, avoiding hazards, or when a lane is too narrow for you and a car to share it safely. Use directional hand signals to show other drivers that you are about to turn. If you are riding on a sidewalk or crosswalk, you have all the rights and duties as a pedestrian. However, you must yield the right-of-way to pedestrians. Between sunset and sunrise, you must have a white light visible from 500 feet on the front of your bicycle and a red reflector and a red light visible from 600 feet on the rear. Be seen – wear neon or fluorescent colors and wear something reflective when riding at any time during the day. All bicyclists and passengers under age 16 are required to wear helmets. However, it is recommended that all bicycle riders wear a helmet, no matter your age. When riding with others, you may not ride more than two side-by-side unless it is part of a roadway reserved for bicycles; you must ride single file if you and the other rider are impeding traffic. 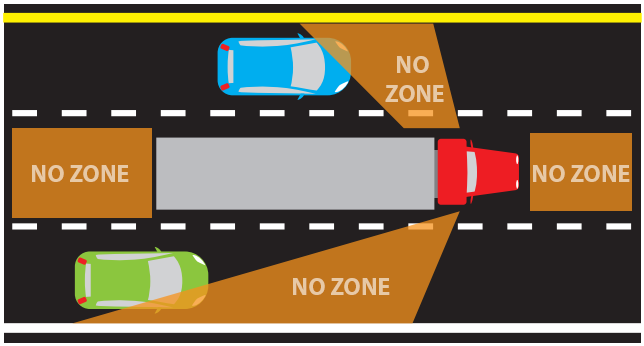 Motorists are encouraged to stay out of the “No Zone.” Commercial motor vehicles have large blind spots in front, behind, and on both sides of the vehicle; this is known as the “No Zone.” Even though large vehicles have several rear-view mirrors, other vehicles will be hidden from view if within the “No Zone” or blind spot. Do not tailgate; you’ll be in the rear blind spot and may collide with the truck if it stops unexpectedly. If you are stopped behind a truck on an upgrade, leave space in case the truck drifts back when it starts to move. Also, keep to the left in your lane so the driver can see that you’re stopped behind the truck. Do not use high beam headlights when you are following a truck at night. Bright lights will blind the driver when they reflect off the truck’s large side mirrors. When you meet a truck coming from the opposite direction, keep to the right to avoid a sideswipe crash. Commercial vehicles often need to swing wide to the left in order make a right turn. Do not drive between the commercial vehicle and the curb—they will not be able to see you. Never cross behind a truck that is preparing to back up or is in the process of doing so. Remember, the size of most trucks and trailers completely hide objects behind them from view. Pass trucks on the left side for maximum visibility. Avoid cutting in too soon when passing a truck. Large vehicles cannot stop as quickly as other vehicles. When a truck passes you, keep to the right side of your lane. Do not speed up while the truck is passing you. Download the Social Media Posts PDF and click on the thumbnails below to make posting on social media quick and easy! Make sure to use hashtag #SharetheRoadFL too.